Foothill at Chico. Winner: Chico. I wouldn’t be surprised if the Panthers get a cathartic romp here, putting a big number up just to feel better after all those close calls they have had and the forfeit loss. 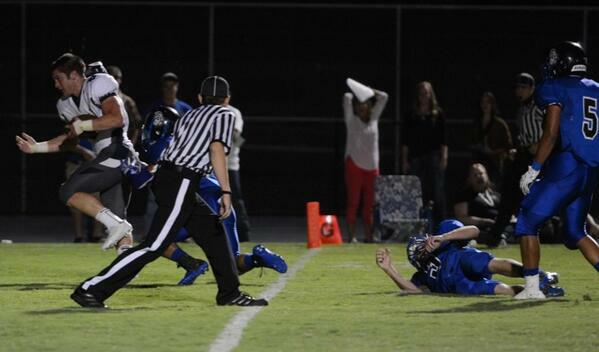 Foothill needs to eat some clock and not turn the ball over. Winner is thinking playoffs. Loser is thinking what could have been. Pleasant Valley at Red Bluff. Winner: Pleasant Valley. I think a 1-point win against Shasta is at least a bit more impressive than Red Bluff having to rally and then hold off Wheatland by 1 point as well. I’ll go with big momentum, which PV has embraced with a burden-lifting win against Shasta. Vikings defense seems to be peaking, and Spartans have some injuries on the offensive side, which might make for another shutdown effort for PV. Orland at Oroville. Winner: Orland. Trojans still not real healthy at some key spots including quarterback. But Orland is tested and can grind out wins with defense, ground game and no turnovers. A formula that has worked before for Orland. Trojans ran the ball 25 times and passed none in last week’s second half against Las Plumas. Oroville’s offense has picked up, but don’t think the defense can contain Big Arthur Flynn. Paradise at Shasta. Winner: Paradise. I have no idea what to make of Shasta. You’d think a team with a pretty balanced offense that includes some offensive linemen who are big and formidable would be a recipe to travel well. But outside a high-scoring win at Lassen, that hasn’t been the case really. Paradise’s ground game seems to be rounding into shape. The second seed for D-I is likely on the line. Las Plumas at Gridley. Winner: Las Plumas. The hosts have been outscored 119-3 in their past two contests. Guess which side I’m going to take? Anderson at Corning. Winner: Corning. The visitors lost to the team in the above contest that has been outscored 119-3 in their past two contests. Guess which side I’m going to take? Note, this is Corning’s homecoming, and apparently the Cardinal put on a pretty good show for homecoming. At least, that’s what I’ve been told on Twitter. Haven’t had the chance yet to witness one myself. Willows at Durham. Winner: Willows. Until someone in Division III knocks off the two-time defending section champion Honkers, why go against them? Durham is interesting because the Trojans are a versatile offense with a good group of skill-position players that allow them to be a balanced attack. Honkers rely on a ground game that can revolve a few running backs, but there’s not much secret to what Willows wants to do. Grind you down with a tough defense and run over you on offense. This is the game this week among small schools this week. Hamilton at Esparto. Winner: Hamilton. Esparto is winless. Hamilton’s two losses are to quality opponents in Willows and Durham. Braves too tough. They took over game against Williams early, and I wouldn’t be surprised if they do the same. Biggs at University Prep. Winner: Biggs. Wolverines are unbeaten, joining Enterprise and Dunsmuir as only section teams yet to lose. Willing to think the Wolverines’ wishbone attack travels well. Biggs seems on the verge of securing the No. 1 seed for the Division IV playoffs. A win here gets them closer. Princeton at Loyalton, Winner: Princeton. Bryan Lex’s Eagles have won five straight games since dropping the first three games, which were against some of the tougher teams Division VI (8-man) has to offer. Eagles continue climb toward a possible home playoff game here. The right stuff: Orland over Las Plumas, Central Valley over Corning, Winters over Oroville, Biggs over Portola, Sutter over Gridley, Hamilton over Williams, Willows over Mount Shasta, Princeton over Westwood, West Valley over Yreka, Enterprise over Foothill, Lassen over Anderson, Red Bluff over Wheatland. So on the season: 60-25. Foothill at Chico, yours truly @JShufelberger and make sure you keep an eye on the one and only @JasonHalley_ER for photos and videos as well. Pleasant Valley at Red Bluff, @tjholmes_RS. Willows at Durham, @jtlarson and from a fan’s perspective @Phinatic_Dave offered to post some updates. Give him a follow, he’s a big Dolphins and Oregon fan. Enterprise at Sutter, @advarsitysports for Marysville Appeal-Democrat Sports Editor Jimmy Graben’s updates. Shasta at Pleasant Valley. Winner: Shasta. Too many offensive weapons and a couple of mammoth linemen for Shasta whose names are hard to pronounce and harder to beat. Chico at Paradise. Winner: Chico. Like the dual-threat offense to outscore Paradise, though 1-2 turnovers for either side will make the difference. Orland at Las Plumas. Winner: Orland. Hurting Trojans get healthy in win at Harrison Stadium. Corning at Central Valley. Winner: Central Valley. Interesting game serves as bounce-back chance for Falcons. Oroville at Winters. Winner: Winters. Tougher pick after Oroville’s 60-0 victory over Gridley. Portola at Biggs. Winner: Biggs. Bears repeating that the Wolverines are one of two undefeated 11-man teams in the Northern Section with Enterprise the other..
Durham at Pierce. Winner: Durham. Trojans continue roll. Gridley at Sutter. Winner: Sutter. Gridley fell 60-0 to Oroville. Sutter can do much worse. Williams at Hamilton. Winner: Hamilton. Braves remain a strong playoff team in Division III. Mount Shasta at Willows. Winner: Willows. Honkers still considered the team to beat in D-III. Westwood at Princeton. Winner: Princeton. Eagles ascending in 8-man and win at home. Bonus: Taking West Valley over Yreka at home, Enterprise over Foothill on the road, Lassen over Anderson on the road, and Red Bluff at home over Wheatland. The right stuff: Foothill over Pleasant Valley, Chico over Red Bluff, Enterprise over Paradise, Durham over Trinity, Biggs over Chester, Hamilton over Quincy, Willows over Live Oak, Princeton over Greenville. So on the season: 48-22. Can’t make it to the games? Follow me on Twitter @JShufelberger for Orland at Las Plumas. Follow @jtlarson for the Chico at Paradise matchup. @Post_RickSilva will also have some updates from Chico-Paradise. Follow @tjholmes_RS for Enterprise at Foothill and @tlawrence_RS for Lassen at Anderson. Follow @‏RichGreeneNews for Wheatland at Red Bluff. If you’re looking for some Butte College at Santa Rosa info follow @TravisSouders. Foothill at Pleasant Valley. Winner: Foothill. Chico at Red Bluff. Winner: Chico. Paradise at Enterprise. Winner: Enterprise. Gridley at Oroville. Winner: Gridley. Trinity at Durham. Winner: Durham. Las Plumas at Wheatland. Winner: Wheatland. Orland at Corning. Winner: Orland. Biggs at Chester. Winner: Biggs. Hamilton at Quincy. Winner: Hamilton. Live Oak at Willows. Winner: Willows. Princeton at Greenville. Winner: Princeton. Week 5: 7-4. Coulda, woulda, shoulda. As my old football coach liked to say. The right stuff: Enterprise over Chico, West Valley over Pleasant Valley, Paradise over Foothill, Wheatland over Oroville, Biggs over Burney, Gridley over Anderson, Princeton over Mercy. Didn’t see these coming: Winters over Las Plumas, Sutter over Orland, Hamilton at Willows, Corning over Lassen. So on the season: 40-19. Can’t make it to the games? Follow me on Twitter for Foothill-Pleasant Valley @JShufelberger, follow @TravisSouders for Gridley-Oroville, and @jtlarson for the Paradise-Enterprise matchup. Follow @tjholmes_RS for his take on Paradise-Enterprise and @tlawrence_RS for West Valley-Central Valley. Week 4: 10-2. I’ll take it. So on the season: 33-15. Vegas, baby, Vegas. Have to make it quick. Have to drive to my game. Picks only. Enterprise at Chico. Winner: Enterprise. Pleasant Valley at West Valley. Winner: West Valley. Winters at Las Plumas. Winner: Las Plumas. Paradise at Foothill. Winner: Paradise. Sutter at Orland. Winner: Orland. Home-field has seemed to be the difference the past few seasons. Oroville at Wheatland. Winner: Wheatland. Burney at Biggs. Winner: Biggs. Anderson at Gridley. Winner: Gridley. Willows at Hamilton. Winner: Hamilton. The toughest call of the week, but I’ll take the hosts as Willows might be a little too beat up after playing Orland and Corning in back-to-back weeks. Corning at Lassen. Winner: Lassen. Saturday’s game: Princeton at Mercy. Winner: Princeton. Can’t make it to the games? Follow me on Twitter for Winters-Las Plumas @JShufelberger, follow @TravisSouders for Enterprise-Chico, and @jtlarson for the Paradise-Foothill matchup. 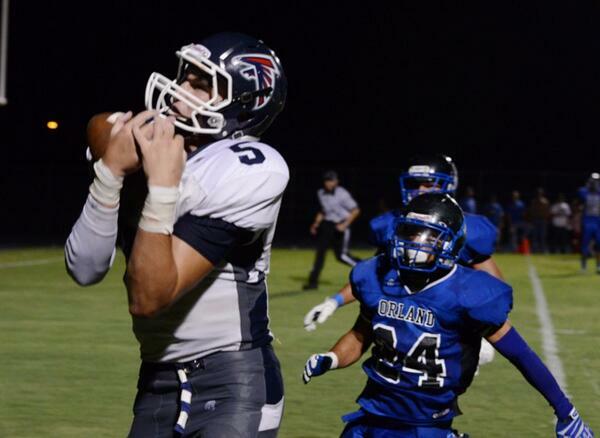 Follow @tjholmes_RS for Pleasant Valley-West Valley and @tlawrence_RS for Red Bluff-Shasta. Who’s got better picks (in Week 4) than me? ***Well, I would hope somebody! Kidding aside, and thanks to Thomas Lawrence of the Record Searchlight for the high school football picks header suggestion after using Mike Singletary and “The Natural” for previous headlines. Without further ado, let’s get to the picks. Week 3 Picks: I went 7-3. I’m not even Greek. (that’s for audience members who are NFL fans 40 or older). ***You think I’m going anything different after a 7-3 week? Heck no. I’m even keeping the same lame intro. The right stuff: Pleasant Valley over Oroville. Anderson over Las Plumas, Orland over Willows, Red Bluff over Corning, Princeton over Herlong, Chico over Nevada Union, and the bonus pick Enterprise over Central Valley. Didn’t see these coming: Durham over Hamilton, Gridley over Live Oak, Biggs over East Nicolaus. So on the season: 23-13. Getting better. Marked improvement. Now, let’s see if it won’t go to my head. Central Valley at Chico. Winner: Let’s get back to this one. Keeping you in suspense. Pleasant Valley at Paradise. Winner: Paradise. Bobcats had last week off. Give Rick Prinz and Co. extra time for preparation is usually not a good way to win. Victory Bell game: Oroville vs. Las Plumas. Winner: Las Plumas. I’ve covered this game the past three years. I’m 1-2 with last year’s LP victory the one I predicted. I think it will be LP again as the Thunderbirds seem to be getting a grasp on the new offense that has been installed prior to the season. T’birds can run some and pass some. Oroville is a bit more one-dimensional. Two beats one, and I think LP does the same. Durham at Quincy. Winner: Durham. Trojans get the win without wideout Lucas Mullarkey who will miss this game. Durham is just tapping into their potential. Orland at Gridley. Winner: Orland. Trojans won’t fall to Bulldogs, who won an emotional overtime contest last week to get their first victory in more than a year. No one will mind if they take a week to soak in their first Harvest Bowl triumph, which came on Emery Haddy TD sneak in overtime. Orland takes care of business. Esparto at Biggs. Winner: Biggs. I won’t go against the Wolverines for the second-straight week. They keep Spartans winless and stay unbeaten themselves. Portola at Hamilton. Winner: Hamilton. Braves looked out of sorts against Durham last week. It’s hard to keep Andrew Shippelhoute and company down for two straight games. Bounce-back time. Corning at Willows. Winner: Corning. Both teams played up last week and took a loss for it. Willows plays another D-II team in Cardinals, and they get the win this time around. Wouldn’t be shocked to a Honkers’ win. Princeton at Westwood. Winner: Princeton. Eagles continue ascent after brutal start to schedule. OK. It’s go time. Central Valley at Chico. Winner: Hold on, one more minute. I’ve been rolling this around for a while, especially since I’m covering this one. Been back and forth. I mean when was the last time Chico was the team that played slower, more deliberate than its opponent? This should be a fan favorite. There are a lot of reasons to go with CV. Chico played Saturday night in the mud and has one less day to rest and prepare. Panthers are at home and it’s homecoming today. Chico defensive coordinator held the same position with Central Valley when the Falcons won a section title a while ago. This is by no means, a cinch. But give me Chico in a close one. Bonus section pick: I’m going to go with three because, hey, I make the rules here. Enterprise over Red Bluff, Turlock over West Valley, and Sutter over Wheatland. Can’t make it to the games? Follow me on Twitter for Central Valley-Chico @JShufelberger, follow @TravisSouders for the Victory Bell game between Oroville and Las Plumas, and @jtlarson for the Pleasant Valley-Paradise paring. Follow @tjholmes_RS and @tlawrence_RS for their updates on games in the Redding area. Comments Off on Who’s got better picks (in Week 4) than me? This is an interesting story on youth football league in nearby Sutter. Coaches are getting suspended and teams getting fines hundreds of dollars if a team wins by 35 points or more. What do you think? Is this necessary? Is this the right way to go? Feel free to throw some comments below. Well, I would hope somebody! Kidding aside, and thanks to Thomas Lawrence of the Record Searchlight for the high school football picks header suggestion after using Mike Singletary and “The Natural” for previous headlines. Without further ado, let’s get to the picks. Week 2 Picks: I went 7-4. Better, but not quite enough to start fist-pumping a la Tiger Woods. Didn’t see these coming: Lassen over Chico, Paradise over Sonora, Central Valley over Orland, Bonus: Enterprise over West Valley. So on the season: 16-10. Not bad. Not bad. But let’s see what we can do in Week 3 with several rivalry games on the schedule and a pair of games Saturday. Oroville at Pleasant Valley. Winner: Pleasant Valley. Vikings beat the other Harrison Stadium tenants 41-0 last week. PV goes to 2-1 before meat part of its season starts with Paradise, which is off this week. Oroville looks to find some consistency, and get ready for its rivalry game next week against the T’birds. Las Plumas at Anderson. Winner: Anderson. This game was close last year, and the Thunderbirds nearly won. I’ll take the home team. Hamilton at Durham. Winner: Hamilton. This is the game I’ll be covering and updating on Twitter @JShufelberger. Braves beat up on Durham 20-0 last year as the injury-marred season truly began to take hold and catch up to the Trojans. The difference will be the top-level Braves in Andrew Shippelhoute, who might be the Division III MVP when all is said and done, Tim Bekendam, Austin Burbank, Ricky Pompa and Theron Fumasi. But this game will be closer than the previous matchup. Should be a good one as the Trojans finally found solid footing last week in their home opener. Willows at Orland. Winner: Orland. The 90th meeting in the series history, known as the Battle for the Ax. The Trojans, who lead Willows all-time at 45-43-1, have chopped down their rival ever since coach Mike McDonald took over the program in 2009, winning four straight by a combined score of 123-30. Much of that stems from a 52-0 shellacking in 2011, the Trojans’ section title-winning season. Willows won a squeaker over Winters 28-27 last week. Perhaps, the Honkers were preoccupied with this game in their minds. Orland had its fill with a 21-19 loss at home to Central Valley. I expect the really good Division II team (Orland) to beat the really good Division III team (Willows). This is a game I would prefer to see in person one of these times. Red Bluff at Corning. Winner: Red Bluff. The smaller-school Cardinals have won their share of the Tehama County Shootout, but the Spartans have righted things in the past couple of years and will flex their muscles like a Division I team should against a D-II team. There will be no shame in this setback to the Cardinals. Both teams have romped to a 2-0 start with Cardinals hosting Las Plumas then Oroville and Red Bluff besting Oroville and Anderson in succession. Live Oak at Gridley. Winner: Live Oak. Live Oak gets the win over the Bulldogs, who are trying to find some consistency after renovations of the Bone Yard, their stadium, led to a forfeiture against Monterey a week ago. Biggs at East Nicolaus. Winner: East Nicolaus. Tempted to take the Wolverines after their 2-0 start, but Spartans play in Division III and Biggs is a D-IV program. East Nicolaus also has nearly double the players on its roster 41-22. That will come in handy as the game progresses. Princeton at Herlong. Winner: Princeton. Eagles have had brutal schedule to start the season even with three home games. That’s just toughened them up for a team that’s already had a forfeit loss and a forfeit win. Nevada Union at Chico. Winner: Chico. Home cooking helps. These teams are winless, but that’s not all that telling. Chico went to Center in Antelope and nearly tied a ranked team with a late 2-point conversion. Then Chico had the Susanville trip to Lassen. And that’s rarely fun or fruitful. The Panthers finally get going with their first home date of the season on Saturday. Nevada Union, though, has played McQueen of Reno, Nev., Grant, the Sacramento power that Paradise hosted in Week Zero, and Pleasant Grove of Elk Grove, which is well thought of as well. The Grass Valley team fell to Grant 46-6, and then 62-7 to Pleasant Grove. The Miners might be too beat up for this one considering that schedule. Still, this game will be close and competitive. I’ll be at this one as well and updating @JShufelberger on Twitter as will be the esteemed E-R photographer Jason Halley @JasonHalley_ER. Bonus: Central Valley at Enterprise. Winner: Enterprise. There’s not a singular section game out of the area that has all the hoopla of last week’s West Valley-Enterprise tilt had. So this is it. Don’t know if the Falcons are in the Hornets’ class despite a 21-19 victory at Orland last week. Hornets probably will have some let-down factor in them, and they might be banged up. Still have to like them for what they have shown including a 28-3 throttling of the Eagles. Central Valley’s Tony Penta carries the ball during Friday night’s 21-19 at Orland. The fast-paced offense the Falcons implemented this offseason was working well with running back Connor Silveria brushing off initial contact and picking up chunks of yardage and quarterback Timmy Naylor having the composure and quick feet to improvise his way for third-down conversions. “They hit us in the mouth first,” said Orland’s Kavi Ram, who had more than a 100 yards receiving and the Trojans’ final score, a 17-yard TD reception. But the unsung heroes – besides Falcons’ kicker Jesus Guiterrez for being a perfect 3 of 3 on extra points – was the defensive front of CV, which blocked a field goal, an extra point, stuffed what would have been a tying 2-point conversion midway through the fourth quarter and stifled Orland’s run game most of the night. Orland quarterback Tyler Batchelder finished with 53 yards rushing on 19 carries. Fullback Arthur Flynn had 65 yards on 10 carries with 20 yards coming on his first of two TD runs. Still, that was a far cry from what the Trojans would like to do on the ground. Defensive coordinator Matt Diskin and coach Matt Hunsaker said that was the plan: to make Orland throw the ball. They just didn’t think the Trojans would fare so well at it. The coaches also likely hadn’t planned on four fumbles of their own, three of them coming after CV took a 21-0 lead that almost provided Orland the means to an unthinkable victory for much of the night. Despite the fumbles, the Falcons’ head coach seemed pleased with Silveria, who he called “a real workhorse,” and his offensive crew. Hunsaker was complimentary of Timmy Naylor, talking about what Naylor was able to do even though he missed basically the entire offseason because of labrum surgery. If CV can even remain healthy with its game at Enterprise next week and a road trip to Chico, the Division II title chase just became much more interesting as the Falcons could crash the presumptive party of a West Valley-Sutter rematch of last year’s final. ORLAND — The Central Valley High football team first ran away from Orland before holding off a hard-charging Trojans squad for a 21-19 victory Friday night. Connor Silveria ran for 199 yards and two touchdowns on 32 carries, and quarterback Timmy Naylor threw for 135 yards as he completed 12 of 16 passes at Trojan Stadium in a game that had the feel of a playoff matchup but also featured the execution of an early season contest as well. Three late Falcon fumbles aided an Orland charge after Central Valley took a 21-0 lead with 1:32 left in the third quarter on Naylor’s 21-yard touchdown pass to cousin Kolton Naylor. Until then, Orland’s best scoring chance came on a 35-yard try for a field goal that was blocked earlier in the third. But the Trojans responded trailing by 21. A five-play drive started with a 32-yard catch for Kavi Ram, and it ended with a 20-yard run from Arthur Flynn. That’s when Central Valley (2-1) got careless with the ball. After Orland cut it to 21-7, the Falcons fumbled the ensuing kickoff return, giving Orland (1-1) the ball at the CV 18. Another Tyler Batchelder-to-Ram connection resulted in 14 yards, and Flynn took care of the rest with a 4-yard TD plunge. His second score came seconds into the fourth quarter, but the extra point was blocked by the Falcons, leaving them up 21-13. Again, Central Valley didn’t hold onto the ball. After a 19-yard run from Silveria, who scored on TD runs of 14 and 3 yards in the second quarter, the Falcons fumbled. Orland took over at its own 40. The Trojans went on an 11-play drive that ended with Ram’s 17-yard TD catch with 7:31 left in the game. The senior finished with 119 yards receiving on nine receptions. Down 21-19, Orland, of course, went for the 2-point conversion. A run to Dominic Alves had no chance as the CV front that had already blocked a field goal and an extra point penetrated the Trojans’ backfield at the snap of the ball. The Falcons then finally held on to the ball — for a while at least. Twelve plays later, though it was back in the Trojans’ hands thanks to the Falcons’ third fumble of the half and fourth of the game. Orland took over at its own 24 with 2:48 left in the game. Down two, a field goal or a TD would be enough. A 26-yard completion to Junior Maldonado from Batchelder got the Trojans to the 50. But on the next play, an Orland receiver fell down and Sawyer McDonald intercepted Batchelder. Central Valley took over at the Trojans’ 31, and from there the Falcons ran out the rest of the clock with Timmy Naylor taking a knee twice at the Orland 5. “If it weren’t for those fumbles, it wouldn’t have been that close,” Kolton Naylor said. After a scoreless first quarter, a 14-yard TD run from Silveria made it 7-0 in favor of CV — which entered the game ranked fourth among Division II teams in the North State Media Poll. That came with 9:59 left in the second quarter, but CV wasn’t done against the third-ranked Trojans. After the teams exchanged fumbles — CV’s coming on a punt return and Orland’s coming on a Batchelder run at the CV 33 — the Falcons went up 14-0 on a 14-play drive that covered 67 yards and started with 5:07 left in the half. Silveria capped the drive with a 3-yard TD run with 41.5 seconds left in the half. The fast-paced attack the Falcons implemented this season worked as they ran off 41 plays compared to Orland’s 22 in the first two quarters. “They hit us in the mouth first,” Ram said. CV also benefited from the quick composure and quicker feet of Timmy Naylor. The quarterback recovered after a number of errant shotgun snaps only to recover for positive yardage on a scramble or more often a completed pass downfield. Timmy Naylor, who doubles as the teams’ punter completed a fourth-down pass to James Quinn for 21 yards on a fake late in the first quarter. That led to Silveria’s first TD run in the second quarter. Central Valley’s Razi Lovett had six catches for 63 yards. 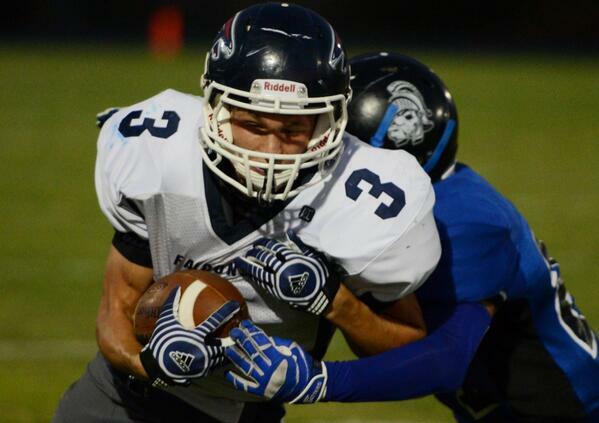 For Orland, Batchelder ran for 53 yards on 19 carries and Flynn had 65 yards on 10 carries. Batchelder threw for 163 yards on 14-of-20 passing. “I’m sure we’ll see them again,” Kolton Naylor said of Orland as both two teams are expected to qualify for the playoffs. But for now, Central Valley plays next Friday at Enterprise, a 28-3 winner against West Valley. Connect with Sports Writer Joseph Shufelberger at www.twitter.com/JShufelberger. RUSHING — Central Valley, Silveria 32-199, Lovett 6-19, Penta 6-33, T. Naylor 8-2, McDonald 3-16; Orland, Batchelder 19-53, Flynn 10-65, Gonzalez 1-13, Maldonado 2-7, Mendoza 1-15. PASSING — Central Valley, T. Naylor 12-16-0-135; Orland, Batchelder 14-20-1-163. RECEIVING — Central Valley, Penta 2-19, Lovett 6-63, Quinn 1-21, McDonald 2-11, K. Naylor 1-21; Orland, Ram 9-119, Maldonado 2-30, Gonzalez 1-10, Batchelder 1-(minus 6), Wiseman 1-10. JV — Orland def. Central Valley. Bring on Week 2 (3-0 in Week Zero; 6-6 in Week 1, so overall 9-6). I hope I can harnass my natural ability to pick football games. Is that enough bad puns? Just in case, let’s swing for the fences. Here we go. Pleasant Valley at Las Plumas. Winner: Pleasant Valley. The Vikings right the ship. Chico at Lassen. Winner: Chico. If the Panthers can hang tough with Center, then a road trip to Susanville shouldn’t be too bad. Oroville at Corning. Winner: Corning. The Cardinals stormed the Thunderbirds at home. Could be more of the same, but Tigers played better in second half vs. Red Bluff in Week 1. Sonora at Paradise. Winner: Sonora. Sonora had a 24-21 loss to a good Turlock team. I think this time it’s a 24-21 win or at least something close to that. Central Valley at Orland. Winner: Orland. Coach Mike McDonald said Division II, which is stacked in the section, would produce a lot of great games. Here’s the first one. Winner becomes the favored spoiler to the presumptive D-II final between Sutter and West Valley, which of course would be a rematch of last year’s championship that went two overtimes. Central Valley is trying its hands on a snap-the-ball-quick-as-possible offense. Orland is playing its flexbone and has several good athletes. Should be a good ’un. And this is the game I’ll be at. Lower Lake at Durham. Winner: Durham. Two road trips haven’t been kind to Durham. Home cooking helps. Biggs at Williams. Winner: Biggs. The Wolverines’ wishbone attack surprised some by manhandling Fall River. They do the same on the road. Hamilton at Mount Shasta. Winner: Hamilton. If the Braves can beat Pierce, they should be able to get Mount Shasta despite MS’ offensive attack. Too much Andrew Shippelhoute, Tim Bekendam, Austin Burbank, Ricky Pompa and company. Willows at Winters. Winner: Willows. Honkers are a borderline Division II team masquerading as a standout D-III team. Butte Valley at Princeton. Winner: Butte Valley. Think Princeton has been through the grind of Dunsmuir and Redding Christian. Might be too beat up for this one. Monterey at Gridley, already canceled. BONUS: West Valley at Enterprise. Winner: West Valley. I’ve got Eagles 30-20. They had the easier task last week, playing in the Redding area as opposed to the Hornets who are coming off the road trip and probably emotionally draining win at Oakdale. Don’t know if they have enough left in the tank to properly get up for this one in what has quickly become the coronation of the best team in the Northern Section regardless of division. Feel free to put some of your picks in the comments section. Who ya got?